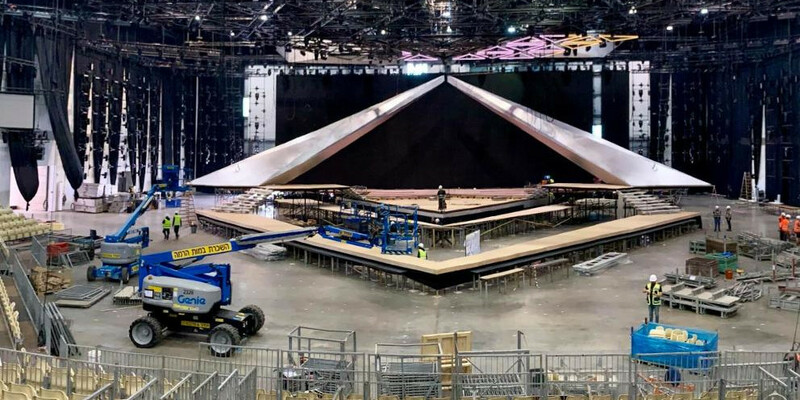 The stage for the Eurovision Song Contest 2019 in Tel Aviv is taking shape. The stage design was revealed last year, and it is again Florian Wieder who has been the creative designer. The stage floor is a 250 square meters diamond shaped center stage including a high resolution LED floor area in the center. The center stage is connected to 25 meters long runways on both sides, accessible from stage by 2 x 12 meters steel constructed bridges. The backdrop of the stage is made of a wall with 12 moveable screens that stand on a track, operating as separate units, with a total width of 36 meters and a height of 12 meters, and can open and revolve 360 degrees. Florian Wieder is the Creative Producer and Production Designer, and has the task of designing the stage for this year's Eurovision Song Contest. It is not the first time he goes into stage design. In his portfolio is a wide range of scenes used for TV production: 16 MTV awards, "America's Got Talent", "Britain's Got Talent", Eurovision Song Contest in Lisbon in 2018, Kyiv in 2017, Vienna in 2015, Dusseldorf in 2011and in Baku in 2012, as well as the Austrian versions of "Star Mania", "Dancing With the Stars", "Heroes of Tomorrow" and "The Big Chance". He has also designed scenes to Beyonce, Jennifer Lopez and U2!